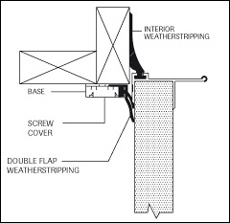 Garaga offers heavy-duty ThermaBlokTM weatherstripping that feature a screw cover and a high quality double-flap rubber strip which resists temperatures down to -22F° (-30°C) and keeps its flexibility. proceed in the same way for the sides. 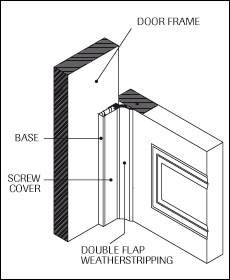 If you have chosen the weatherstripping with an aluminum base instead of a PVC base, you will have to pierce 1⁄8" holes of every 12" for the screws.